Your strength and independence are very alluring in the first house, especially when Pluto adds an element of intensity to your personality. You tend to hide your true feelings for fear of revealing too much, which only makes you more mysterious. On the down side this can also be intimidating. In astrology, Pluto is symbolic of renewal, rebirth, fear of loss and desire for control. 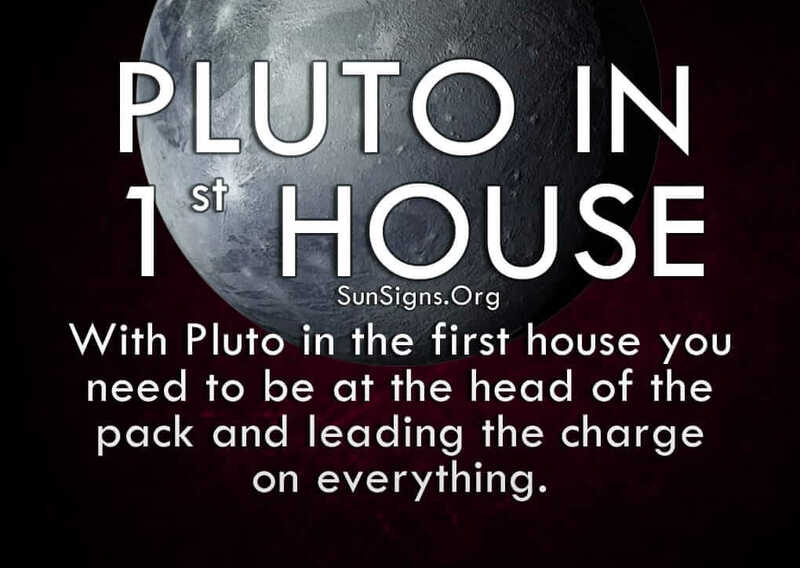 With Pluto in first house you need to be at the head of the pack and leading the charge on everything. Your fear is not being able to keep up and falling behind everyone else. Power is something you want in your hands, not hanging over your head by someone else, so you project a strong and formidable presence at all times. Some people respond to this with respect and admiration, while others shy away from you because they don’t know what to think. This is intensified as Mars is the ruling planet and Aries is ruling zodiac sign. The one thing Pluto in first house do really well is get to the heart of the matter. You don’t beat around the bush or play games, for you don’t have time for such frivolous pursuits. You’re able to read between the lines of any messy situation and see what’s really going on behind the scenes. You don’t accept anything at face value, which makes you incredibly perceptive. That’s how you prevent people from taking advantage of you, so believe in your ability to cut through all the lies and tricks in the world. Use this ability to your advantage and build upon your wealth of knowledge and experience. Allow yourself to go through the necessary transitions to reach a higher level of existence and maturity. Because of your need to be first, people either see you as brave or foolhardy, depending on the outcome. People with Pluto in 1st house, feel empowered and in control, something that’s very important to them. But it’s okay to change things up once in a while and let someone else take the reins to give yourself a break. This is how you can truly learn and grow as a person and find spiritual enlightenment. Not everything in life can be manipulated and things don’t always turn out the way you want them to. You have to learn to ease up once in a while and go with the flow or else you’ll burn out too easily. There’s no need to add to your stress level by worrying over something you can’t control. It’s all in the way you view life and your choices. You can only make it so far before something unexpected throws you off course. It’s how you deal with the unknown that distinguishes you from the pack. If you have Pluto in the 1st house in your natal chart, pay attention to the image you’re sending out to others, for it may have the adverse effect of what you’re looking for. Confidence is one thing, but being a bully is another. Sometimes you have to tread lightly to get what you want, which goes against your every instinct. But there is such a thing as coming on too strong. While you may fear the unknown you never show it, so you will always be surrounded by those who trust in your judgment. Take the confidence from them and adopt it as your own. Your instincts are solid and you have the ability to rise to something you never dreamed possible. The world is yours to do with as you wish.